Why is Climate Change a Threat for Andean Societies? In this article, I will discuss small-scale farmers’ vulnerability to climate change in the Peruvian Andes, using a case of the Quillcay River Basin. The study measured vulnerability of local smallholders to climatic and hydrological changes by analyzing relations between glacier recession, changes in precipitation and socioeconomic factors. The study was implemented using a mixed-method approach, intertwining open-ended interviews with statistical regression analysis. The objective of the study was to contribute to the existing discourse on climate vulnerability in the Andes and other regions with similar challenges using a different perspective and a less common method. The findings of the study also aim to provide guidelines for local policymakers to plan more holistic adaptation strategies to mitigate climate vulnerability of the rural highland communities. The study was conducted in small communities along the Quillcay River Basin in the proximity of Huaraz city, belonging to the Department of Ancash, Peru. 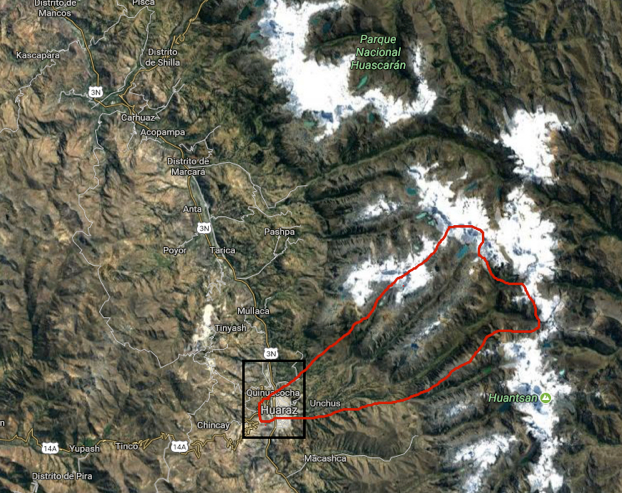 The region pertains to Cordillera Blanca, representing the largest glacier cluster in Peru (Mark et al, 2010). The Quillcay River Basin was chosen for the case study region due to previously reported threats related to glacier recession, changes in climate, and small-scale farming being the main livelihood of local population. Glacier melt water provides a major water supply in the region, particularly for populations living in the upstream portion of the basin. During the rainy season (October-April), precipitation contributes to the river watershed along the whole stream (Rivas et al, 2014; Gurgiser et al, 2015). Map 2.The Quillcay River Basin is indicated with the red line. Source: Edited by the author based on Google Maps, 2017. Small-scale production in the Andes is mostly rain-fed and during the wet season and when it rains less, water for irrigation is received from glacier melt water (Sanabria et al, 2014). In the Quillcay River Basin, seventy per cent of the fields are still rain-fed and rely on precipitation for irrigation. The rest of the farmers (30%) use irrigation systems that are fed by glacial melt water (Castro, 2016). Recent studies have shown that in the last decades, rain-fed agriculture in the Andes has deteriorated due to decreased rain, earlier wet seasons, and extreme rain events destroying yields and subjecting farmers to remarkable economic losses (Gurgiser et al, 2015). Between February and April in 2016, I conducted semi-structured interviews with 16 small-scale farmers (11 men, 5 women) living in the Quillcay River Basin. Furthermore, I interviewed eight representatives from distinct, national, and local agriculture, climate, glacier and water institutions. Although vulnerability assessments have traditionally been qualitative, vulnerability can also be measured by objective, material measures of well-being, such as income, wealth and access to education (Adger, 2006). In my study, I chose to use changes in harvested area and farm gate prices of the most cultivated crops of the region—corn, potato and wheat (MINAGRI, 2015)—together with growth rates of rural populations as measures of vulnerability. I applied quantitative regression analyses to examine the relation of these socioeconomic measures to climatic proxies of changes in glacier mass-balance and precipitation. Analytical frameworks of vulnerability are advantageous tools in research on socio-ecological systems’ exposure to climate hazards, weak resilience and marginal social conditions (Adger, 2006). In this study, I applied vulnerability framework of the Research and Assessment Systems for Sustainability Program (RASSP) by Turner et al, (2003) as an analytical tool to examine the adverse impacts of climatic and hydrological changes on smallholders in the case study site.Here, I will first provide short introductions on concepts of vulnerability and resilience, which are the key components of the RASSP framework, followed by more detailed explanation of the RASSP framework and how it was applied in the analysis. ‘Vulnerability’ as a state refers to a situation in which a socio-ecological system[i] is exposed to external stresses and has low adaptive capacity. ‘External stresses’ imply adverse human or environmental influence outside the system, such as climatic hazards or unequal distribution of resources in the society (IPPC, 2014). Vulnerability is regarded as being constituted by the following elements: exposure and sensitivity to hazards or stresses, resilience, and capacity to adapt. ‘Exposure’ refers to the magnitude and duration that the system is subjected to environmental or human-influenced stresses. ‘Sensitivity’implies the degree of external stresses the system encounters and the system’s potential to respond to the exposure of human forces or those originating from the environment. ‘Adaptive capacity’is defined as the extent the system can adjust to the harm caused by stresses. ‘Resilience’is the capacity of a system to cope with stresses and still maintain a relatively stable state after exposure (Gallopín, 2006). The resilience of a system can be assessed by measuring its vulnerability to shocks across time and its ability to recover from them. In order to increase resilience of a system, its exposure to biophysical, economic or social shocks should be tackled to strengthen its adaptive capacity (Gitz & Meybeck, 2012). Figure 1. Place-dimension of framework of the Research Assessment System for Sustainability Program by Turner et al, (2003) applied in this study. Figure 2.Factors that had affected smallholders’ vulnerability in the Quillcay River Basin, and adaptation strategies in use and factors strengthening adaptive capacity to enhance resilience. Source: Author, based on the RASSP framework by Turner et al, 2003. However, the drawback of fitting in so many variables in one framework makes a case study based analysis somewhat complex. The author therefore suggests that each study should adjust the framework to the context and dimension of the research (Turner et al, 2003). This study, therefore, focused on the place dimension of the framework (figure 1). The vulnerability aspect was examined through assessing the sensitivity of small-scale farmers to the stresses caused by climatic and hydrological changes in the Quillcay River Basin. This was implemented firstly by examining the magnitude of the climatic and hydrological stresses; secondly, by evaluating the impacts on well-being and livelihoods of the farmers due to exposure of stresses; and lastly, by identifying the amount of resilience (i.e. what the adaptation capacity of the small-scale farmers to climatic and hydrological changes is, which factors have facilitated successful adaptation, and what the elements that should be addressed to strengthen their resilience are). A summary of factors that arose in the analysis of interview material is illustrated in figure 2. When interviewing the smallholders of the Quillcay River Basin, many of them talked about diverse climatic changes they had observed in the region during the last decades. However, the interviewees were most concerned about shortened rainy periods and that the precipitation was no longer ‘soft and continuous as it used to be’ but nowadays came down as torrential rain followed by periods of drought. Melting of the glaciers was also worrying the local farmers, especially from a cultural perspective. The white glacier peaks have traditionally been a landscape trademark of Huaraz. Furthermore, the small-scale farmers were also feeling uncertain about how glacier retreat would affect the amount of water flowing in the rivers that they were using to irrigate their fields. I was told that that it could be already seen that there was less water in the rivers than before. The interviewed farmers were also concerned that in recent years their yields had declined or been completely damaged due to anomalies in precipitation. The smallholders also perceived that they now gained less money from farming than before. However, I was told that the main reason for the decreased income from farming was a growing need to use fertilizers. I was explained that since the fertilizers are very costly, their use lowers the net income received from agricultural products. Some of the farmers also mentioned that prices for agricultural products had fallen considerably during the past years. They said it was not worthwhile descend to the markets in the city of Huaraz to sell their products since the prices did not even cover the investments made on agrochemicals and their own labor input. 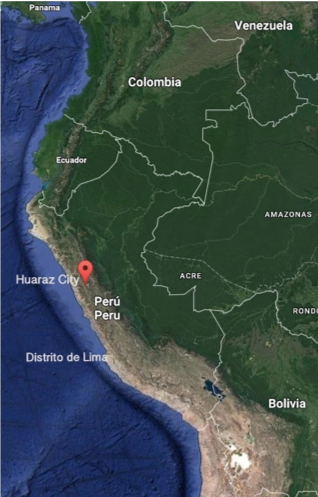 Many smallholders had also already moved to the city of Huaraz, coastal cities such as Chimbote or to the capital Lima, to search for other sources of income. Most of them now worked in low-skilled jobs (mainly in the construction sector) or had started in their own business selling clothes or other commodities. Some of the farmers who had stayed in the region had attempted to construct irrigation systems or use expensive fertilizers. One of the interviewees said that he had begun to experiment how other crops or vegetables such as avocadoes would grow in the changed climatic conditions in the highlands. All the farmers who had planned successful adaption strategies also had some educational background, professional skills or sufficient economic assets, which was not the case with all the interviewees. External support was found to have a key impact on strengthening adaptive capacity of the smallholders, especially of those who otherwise had low financial or social capacities. The Municipality of Huaraz was the major actor constructing new canals and water reservoirs in the region as well as providing material aid for the rural residents. Nevertheless, it remained unclear how the projects were distributed since some of the farmers said that they had never received any kind of help from the municipality. Local NGOs were said to have helped in the construction of reservoirs for potable water in some villages. Overall, the smallholders who had received construction materials or financial aid from external actors to construct canals and reservoirs said that they had enough potable and irrigation water, while those who had not received any kind of help claimed that they were suffering from lack of water and declining yields. During interviews, some of the smallholders also began to discuss their feelings of “being forgotten” compared to urban residents. The interviews were conducted during the presidential election campaigns of 2016, and some informants saidthat at that time, politicians came to visit them with “hands full of promises”. Their experience from previous political campaigns was that these promises were later never fulfilled. The interviewed government officials agreed that changes in precipitation and accelerated glacier recession have already affected the highland watersheds and consequently pose challenges for small-scale farming in the region. However, some of them mentioned that it was sometimes difficult to begin developing projects in the rural communities because local people do not always want to cooperate with authorities. They also mentioned additional factors such as low education of rural residents, weak knowledge in efficient water use, skills in modern agricultural practices, and lack of political entitlement in rural areas. In their opinion, these were the major reasons behind socioeconomic problems in the rural highlands and that the interference from climatic changes only makes the situation worse. They emphasized that the key in building efficient adaptation strategies would be promoting education, providing novel research on agriculture and strengthening government involvement in the rural regions. In the study, I used Pearson’s correlation and ordinary linear regression analysis (OLS) to complement the qualitative analysis and to test the correlations and their strength between climatic and socioeconomic variables. The climatic variables chosen for the study were changes in precipitation and glacier mass balance. For the socioeconomic measures, I used the growth rate of the rural population and the harvested area and price of corn, potato and wheat. The results from Pearson’s correlation suggest that accelerated glacier retreat has had an impact on the decline in harvested land of all the three crops measures in the study. On the other hand, changes in precipitation did not show great impact on decline in harvested area. Moreover, weak correlations were found between prices of the crops, growth rate of rural population and climate proxies. In the OLS analysis, climate proxies were found to only modestly explain the changes in all the socioeconomic measures. Changes in glacier mass balance had the strongest relation with decline in harvested area of wheat, but precipitation was not found to be significant in explaining any of the changes in harvested areas. On the other hand, precipitation had stronger relations to the prices than glacier retreat. Lastly, the two climate proxies only weakly explained the changes in the growth rate of the rural population. Findings of the study suggest that there are some discrepancies between how the interviewed small-scale farmers perceive their vulnerability to climatic changes, how the interviewed governmental representatives view the situation, and what statistical evidence demonstrates. In line with the results of interview data, quantitative analysis confirmed that glacier retreat has influenced agricultural practices in terms of decline in the harvested area of corn, potato and wheat. However, statistical analysis did not show strong relations between decreased rain and farming, although the interviewed farmers reported harvest failures due to lack of rain. However, the smallholders’ perceptions on shortened rainy period and variability in precipitation seem to respond to the statistics. Therefore, it is suggested that it is the irregular rain events that pose challenges for small-scale agriculture in the study site rather than lack of precipitation. The statistical measurements did not endorse either the farmers’ statements on decreased income from agriculture. First, after correcting for the impact of inflation[ii], the data series showed an increase in farm gate process of all the three crops, especially since the 1990s. Data on prices thus suggest that income from agriculture should have increased. Secondly, according to the regressions analysis, precipitation only partly explains growth in farm gate prices, whereas glacier retreat had almost no significance in explaining changes in the prices. The smallholders also considered that changes in climatic conditions were the major reasons why people had begun to migrate from the highlands to the cities. In the statistical analysis, however, the climatic variables explained the negative trend in growth rate of rural population only to a certain degree. Furthermore, during interviews, both smallholders and governmental representatives mentioned other reasons for migration such as current state policies favoring export-oriented large-scale agriculture production, families abandoning farming for more stable income, and the young generation moving away to seek better education and work opportunities. There are several reasons why partly contrary results were obtained in this study. Firstly, when evaluating qualitative data based on people’s memories, the researcher should be aware of fallibility of the human mind. For example, exceptional weather of recent years can lead to unintentional exaggeration of climate change, despite the fact that the phenomenon might well be part of natural year-to-year climatic variability. Moreover, awareness of participating in a study measuring impacts of climate change might have led participants to assume climate to be the culprit for all the socioeconomic challenges they are encountering. Secondly, the findings of the study suggest that vulnerability of smallholders in the rural highlands seems to consist of multiple factors rather than solely climatic changes. Therefore, it might be that the statistical indicators that were chosen for this study failed to capture the diverse dimensions affecting vulnerability. For this reason, creation of more complex statistical indicies could be beneficial in quantitative climate vulnerability assessment to capture the myriad linkages. Thirdly, due to limitations of this study, variables that may have had an impact on the vulnerability of the smallholders had to be excluded. The authorities for instance brought up the influence of larger political and economic structures on the contemporary socioeconomic struggles in the rural highlands. Previous studies have also suggested that since the neoliberal reforms of the 1990s in Peru, social inequality and deprivation have increased, especially among the poor highland farmers. The new neoliberal scheme led to favoring large-scale agriculture units on the coast due to their higher productivity. The small-scale producers in the highlands, with smaller yields and more challenging sowing circumstances, were left with little importance, albeit, they have historically had an important role in producing traditional Peruvian crops (Crabtree, 2003). Similar experiences were described by the smallholders of the Quillcay River Basin. Future studies are therefore encouraged to explore how complex dynamics of historical, social, economic, political and environmental factors could be coherently embedded in evaluations on climate vulnerability of marginalized populations in the Andes and other regions with similar concerns. In this article I have discussed the findings of the study in which I examined to what extent climatic and hydrological changes have adversely affected vulnerability of smallholders in the Quillcay River Basin. The study was based on less commonly used mixed methods, intertwining perceptions of local farmer, governmental officials and statistical measures. In contrast to previous studies on climate vulnerability in the Andes, this paper revealed that climate factors may not be as substantial in the increasing vulnerability of the Andean highland populations. Due to the limitations of this study, the additional factors that could have possibly had an even more significant impact on the local farmers’ vulnerability could not be examined in as much depth as would be required. However, the findings hint that the vulnerability of the Andean populations is interconnected with complex linkages of historical, cultural, political, social and economic issues that climatic changes only trigger. The significance and relations of these multiple drivers in the dynamics of climate-related vulnerability should be further examined in future vulnerability assessments. Lastly, in order to mitigate vulnerability on a policy level, it would be essential to design adaptation strategies that focus on improving educational, social and economic capacities of the smallholders to be better prepared for climatic threats. This study would have been impossible to accomplish without the smallholders of the Quillcay River Basin. My highest appreciation to my interviewees who opened their homes to me and took their valuable time to participate in the study. I would also like to thank CARE Perú for all the support offered during the field study in Huaraz. I am also most thankful to the key informants from ANA, EPS Chavín S.S., INEI, MINAGRI, SENAMHI and UGHR. Lastly, I would like to thank Dag Retsö, Andrew Stephenson for thoughtful comments on the earlier version of the paper as well as the two reviewers of Alternautas. Anna Heikkinen is MSc. in Economic History from Stockholm University. This article is based on her peer-reviewed paper published in Iberoamericana – Nordic Journal of Latin American and Caribbean Studies on 18 August 2017. IPCC2014 Climate Change 2014: Impacts, Adaptation, and Vulnerability. Part A: Global and Sectoral Aspects. Contribution of Working Group II to the Fifth Assessment Report of the Intergovernmental Panel on Climate Change[Field, C.B., V.R. Barros, D.J. Dokken, K.J. Mach, M.D. Mastrandrea, T.E. Bilir,M. Chatterjee, K.L. Ebi, Y.O. Estrada, R.C. Genova, B. Girma, E.S. Kissel, A.N. Levy, S. MacCracken, P.R. Mastrandrea, and L.L. White (eds.)]. Cambridge University Press, Cambridge, United Kingdom and New York, NY, USA, 1132 pp. [i]The concept of socio-ecological system (SES) implies the intertwining of nature and human subsystems that are scrutinized as a solid entity in vulnerability assessments (Gallopín, 2006). [i][i] The 1980s was a turbulent decade in Peru’s economic history. Throughout the decade, the country confronted several periods of hyperinflation; between 1979 and 1989 prices were rising and falling heavily due to various economic crises and climatic disasters caused by El Niño in 1983 (Webb, 1988; Cermeño & De la Cruz, 1991). In this study, in order to offset the impact of the inflation, farm gate prices were converted from nuevos solesto U.S. dollars.